Daughter are Elena Tonra and Igor Haefeli, a double act that have swept through 2011 with numerous gigs across the UK, put out an EP titled 'His Young Heart', and they end the year with another record, 'The Wild Youth', which is out through Communion Records. Personally I first discovered Daughter whilst they were supporting Benjamin Francis Leftwich during his Autumn tour, catching their intimate and spell-bounding show at the Union Chapel in Islington, where their exquisite performance equalled if not better that of the headliner. 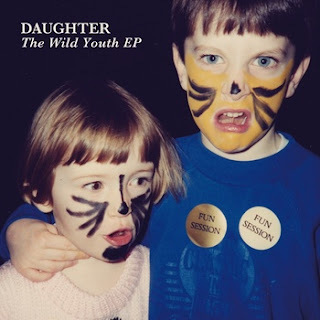 'The Wild Youth' begins with 'Home', a track which showcases what makes Daughter so utterly brilliant. Elena and Igor have an ear to create space within their music, moments where their instruments can breath and the listener can fully appreciate the beauty that is being played out before them. The poignant combination of Elena's lingering vocals and the delicate acoustic/electric guitars demonstrate how simplicity in music is something to be applauded. 'Medicine' is built upon simple piano chords, with the focus put upon the beautiful words and vocals, as is 'Love', with Elena's mystical vocals driving the song along as drums and guitars slowly build to a gentle crescendo. My favourite track on the record is 'Youth', with the thought provoking lyrics having the perfect backdrop of drawn-out music to stand out and be counted.